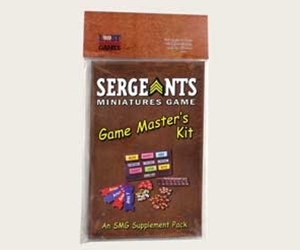 The "Game Master's Kit" helps you run your SMG games smoother and faster than ever before. Each kit is made from the same sturdy and durable material as the SMG board pieces. The Action Stand works with the Story Deck to help show the action sequence of every turn. Twelve (12) color matching Action Stand counters can be placed on the stand to match the story cards and can be seen even from across the room. 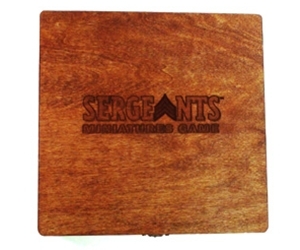 Carry your game with style with a vintage look wooden storage box for Sergeant's Miniature Game.